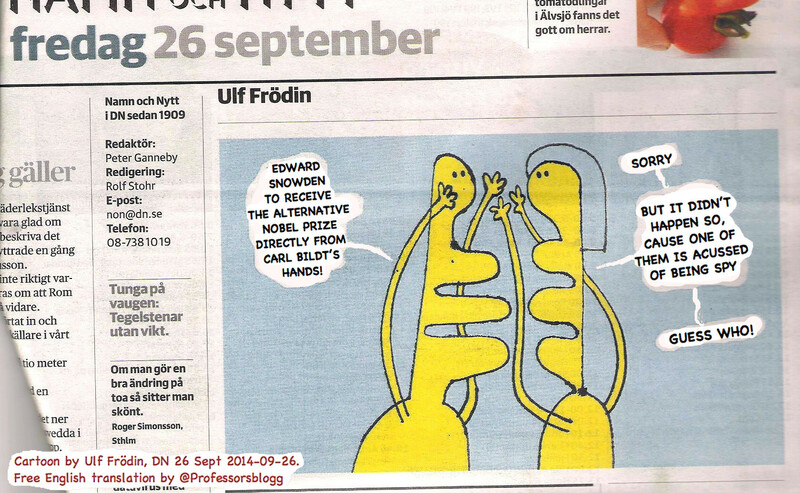 Above, cartoon by Ulf Frödin (Swedish text, original), DN 26 Sept 2014. On Carl Bildt exposed as ‘US secret information officer, see: Carl Bildt, US secret information-officer, according to document released by WikiLeaks.
. . . 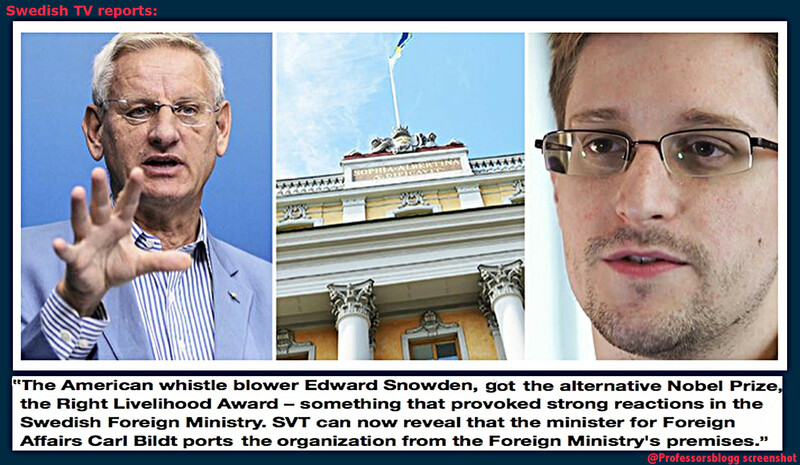 However, the National Swedish Televison SvT announced today in their main news-sending “Rapport”, that Carl Bildt has “strongly reacted against the bestowing of the alternative Nobel Prize to Edward Snowden”, and hence ports the organization from the Ministry offices. The Swedish MSM, e.g. SvD – and of course, The Local – rushed to publish Carl Bildt’s statements on he “had nothing to do” with the decision of banning the award-ceremony from the ministry where he happens to be the boss, and that the all thing was due to “new security routines” [sic] after 30years uninterrupted routines regarding Right Livelihood awards at the Foreign Office locals. Since 1985, the organization Right Livelihood Award is announcing the annual winners of the traditional alternative Nobel Prize at the flamboyant locals of the Swedish Ministry of Foreign Affairs. Err…Until right now, after they communicated to the Foreign Office that the 2014 prize-winner is Edward Snowden. The reaction of the boss at the Foreign Office, Minister Carl Bildt, was to oust the organization giving the alternative Nobel Prize from the Foreign office. End of story. Previously, the Swedish Foreign Office under the command of minister Carl Bildt had erased Snowden and Assange from the invited list to an international conference in Sweden – The Stockholm Internet Forum, which focused on ‘global development as well as surveillance’ – amidst protests from other participants and related international community. ← Three years on Tweeter? What? This is an instructive passage in democracy and a topic of discussion. Even if an individual or an organization – in a chimes clean manner – an expression of a country’s core values, and with freedom of expression and transparency as a basis – gives an application of these values in practice, it gives them no rights to represent these values, or ambitions for his country in legitimacy. So you can both be “Swedish” and yet not be “Swedish” outside your assignment. It is thus the assignment that defines your rights, and presto! So, we have instituted a pyramidal hegemony within a sphere of values and active use of the sense of “citizen” without having damaged the country’s self-image of being an open society where everyone has the same rights and freedoms. The key is not whether the cat catches mice, or whether it’s even a cat, but the important thing is whether it is black or white. This subtlety constitutes the definition of “restricted area” You know you’re a butterfly, but they are prepared for an elephant. In practice, it becomes more a question of sitting beautiful – like a cocker spaniel- and wait for the ration – and not trench around – like a vain stray dog that follows the instinct and the elaborated; that by extension – ensuring its own survival of the species. There is a difference between ‘us and we. ”- we could but us can’t.